Over the weekend I went with my family to the Phipps Conservatory in Pittsburgh. It has the most incredible botanical gardens, both indoor and out, and Light Up Night for Christmas is truly incredible. They have miniature train exhibits, Christmas trees everywhere and an amazing collection of Chihuly sculptures in among all the greenery and tropical plants including thousands of Poinsettas. You meander along paths through rooms filled with cactuses, flowers and plants and trees of all shapes and sizes. My favorite is the orchid room. So naturally I go to capture a few photos, right? 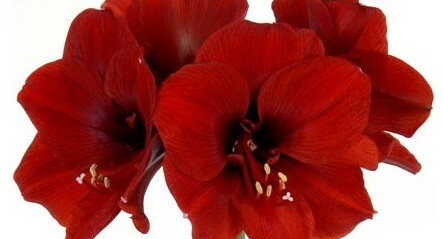 I found myself trying to take a photo of a Ferrari-Red Amaryllis… it was so stunning it stopped me in my tracks. The lighting was just right, the color so deep and rich. But my photos were so bleah!… so like an idiot I kept trying… snap, snap, snap… nothing but yucky, washed-out images… sigh… and I remember it is the reason why paintings go beyond photos. The camera stands in the way of truly seeing the flower. So, I tried to enjoy the moment with that stunning flower before moving on since I was clearly not going to capture its beauty on film. Trying to capture a flower in paint is tough. But trying to capture a flower in paint from a photo is much, much tougher. Don’t get me wrong, I am not getting preachy since I work from photos when I have to, but it is not easy. I easily forget to look beyond the photo to the flower or child beyond the frozen still. I have to remember to look up- to see the child I am painting, and not the photo. On the last day of my portrait workshops we work exclusively from life. The models come back and the attendees have to give up the photos they took for references for composition that they were using on the first day. Sometimes I literally have to rip them out of some artists’ hands and ask them why are they looking at a photo when the most beautiful model is sitting right in front of them. When I paint a portrait commission of a child, I quite often have my children come into the room and just sit with me. I then try very hard to get the feel of their life and color into the painting I am trying to create, even though it is of a different child. Call it life force, call it soul, but it is a tangible thing and it can be painted, but only from the source. Right now I have a painting that is near completion- the “Hot” painting of my son with a soccer ball that I posted as a WIP a few weeks ago. I know I can only finish it when he poses for me and we have been so busy that I haven’t been able to get some time with him and the painting together. Once I do, it will be easy to see what needs adjusted. “Knocked into shape” I call it. Then I can truly capture him in the painting. So if you live near Pittsburgh, Phipps is worth a trip. Just don’t bother with the camera. I would love to visit this place. You made it sound beyond wonderful. Thanks. Can you make the text about the soccer / son painting you’re talking about a hyperlink to the previous story? I tried to search for “hot” but got too many hits. Same with “soccer,” and love to have my memory refreshed. My husband and I are members of Phipps, haven’t been there since last Spring. Thanks for a push to see the winter exhibit. Thanks so much for your inspiring posts…so beautifully written! Thanks Anne! Hope you are well.